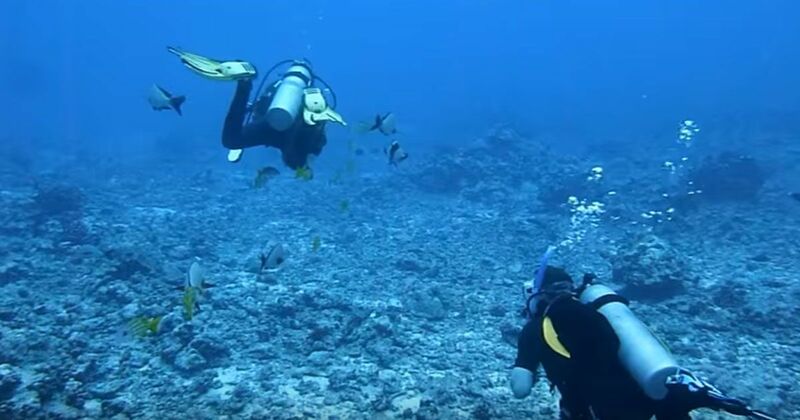 Back in 2011, a group of divers were enjoying a deep sea excursion in Moorea, French Polynesia. They were nearly 100 feet underwater, enjoying the sea flora and fauna of the area when something unexpected happened— a humpback whale swam past them. Before the humpback whale arrived, he gave notice that he was coming. The divers, who were able to capture the encounter on video (see below), also recorded the magnificent beast’s magical song that announced his impending arrival. How common are humpback whale encounters? Humpback whale encounters are surprisingly common. There is a whole cottage industry dedicated to making sure people get to observe the animals in their natural habitat. In Hawaii, where humpback whales often found swimming off the coast, ecotourism has been a boon to the economy, bringing in $20 million a year for the state according to the Hawaiian Islands Humpback Whale National Marine Sanctuary website. According to Gary Crockett, humpback whales are "gentle giants" that happen to be naturally curious. They love to investigate unusual items in their habitat. Crockett says that the whales will come near a whale watching vessel as long as someone tries to catch their attention. Most of the humpback whales who come close are juveniles, as adult humpback whales are less curious than younger whales. Though the whales are thought to be docile creatures who don’t cause a lot of trouble, there have been incidents where people almost died after a humpback whale encounter. A couple of British tourists nearly died when they were kayaking off the coast of California and a humpback whale jumped out of the water and landed on their kayak, according to the Telegraph. What are 3 top surprising facts about humpback whales? There are many interesting things about humpback whales. Humpback whales are known for the enchanting “songs” they sing. The songs that they sing can be heard up to 20 miles away, Sea Shepherd reported. Scientists, according to National Geographic, think that the whales sing the songs to attract mates. Female humpback whales nurse their infants for only a year. After that year, humpback calves dine on krill, plankton and small fish—just like adult humpbacks.